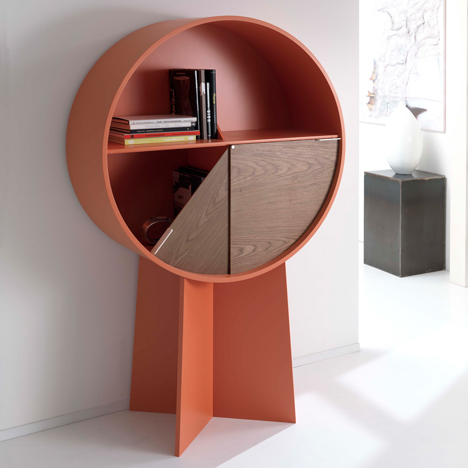 Maison&Objet 2015: quadrants of this circular cabinet by Spanish designer Patricia Urquiola swing open to reveal the contents stored inside. Created for French furniture brand Coedition, the Luna cabinet by Patricia Urquiola holds items within a drum-shaped volume divided into compartments. The top half of the cylindrical display case remains permanently open, while items in the lower portion can be hidden away behind two panels. These quadrants can rotate 90 degrees around the centre of the circle, partially or fully opening the section of the cabinet that is concealed. The storage space balances on two intersecting planes of wood that form a cross-shaped stable base. Luna comes in a varnished walnut veneer or lacquered orange finish. The veneer model features blue and green doors, while the walnut is used for the panels on the orange design. Coedition is showing the design at the Maison&Objet trade fair in Paris, which concludes today. Other products presented at the event include furniture by Luca Nichetto, copper stationary by Tom Dixon and concrete display cases by Matali Crasset. Urquiola recently updated her Maia outdoor furniture range for Kettal by replacing the materials with nautical rope and teak wood.